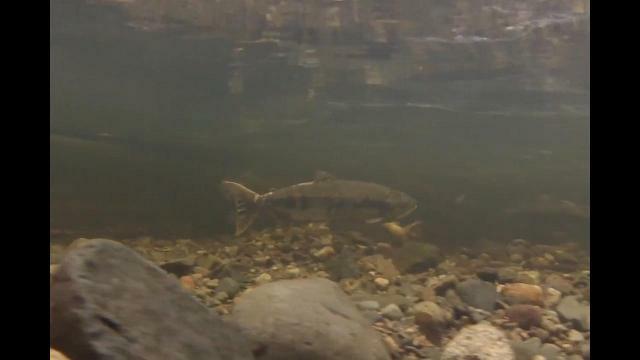 South Island salmon returns are bouncing back in some waterways, but floundering in others in what was expected to be a “disaster year,” say officials. At the end of November, the Colquitz River count was 302 returning coho. As of Dec. 7, numbers only got up to 315, which was low compared to the 1,100 at this time last year. It was the same for Craigflower Creek, where Gary Caton of the Esquimalt Anglers counted 425 fish, mostly coho, but had reason to expect as much as 1,500 to 2,000. Goldstream was struggling the worst with less than 20 coho and chinook salmon counted at the end of November, but numbers have increased steadily since then. “Goldstream chum ended up meeting the escapement goal for the system, but later than expected. It started out looking poor but came in strong at the end,” said Wilf Luedke, stock assessment biologist with Fisheries and Oceans Canada. The Sooke River had a steady year with approximately 500 to 600 chinook returning to date, but chum is still uncertain due to high water levels. Ron Neitsch, owner of 2 Reel Fishing Adventures and member of the Sooke Salmon Enhancement Society said the returns often come in waves of good and bad years, and there are a multitude of factors that can come in to play. Some key factors include ocean and fresh water conditions, depth of water, commercial fishing, and the increasing amount of sea lions and seals eating salmon at the mouth of the rivers. “Thirty five per cent of fingerlings get eaten before they even get to the ocean, not including how many do on their way back in. But there are so many different things that can affect the returns each year,” Neitsch said. Luedke said there was a “warm water blob” off the west coast of the Island, which disrupted the ecosystem and impacted the quality of food available to salmon, so returns by species have been variable. Though this was a bit of a rough year for the South Island, salmon enhancement and environmentalist groups, DFO and hatcheries are working hard to assess the problem and bring the return numbers up for future years. “Low survival rates for salmon are always a concern, and it’s important for us to understand why the survival rates are so low. But this is hard work and will take time,” said Luedke. Neitsch said the South Vancouver Island Anglers Coalition is scheduled to release 500,000 juvenile fish into the Sooke Harbour in 2018 as part of the net pen projects, and in 2019 it hopea to release one million fish. The net pens will allow the juvenile fish grow into larger salmon before they are released into the ocean, which will hopefully giving them a higher chance of survival as well as imprint the smell of local water in their noses so they will return.